If the â€˜future were now,â€™ travelers would feel safer on a rocket to space than being a passenger in a self-driving or autonomous vehicle, according to the annual Allianz Travel Insurance Vacation Confidence Index released today. As the Future of Travel quickly approaches with experimental transport technology accelerating at a rapid pace, the vacation vehicle of tomorrow that is closest to reality today â€“ the self-driving car â€“ is among the most concerning for potential travelers worried about their safety. Self-driving/autonomous vehicles rate lowest for travelers â€œvery interestedâ€� and highest for â€œsafety concernsâ€� among those not interested when compared to all other future travel methods surveyed, including space travel, supersonic travel, Hyperloop high-speed rail, and even so-called flying cars. 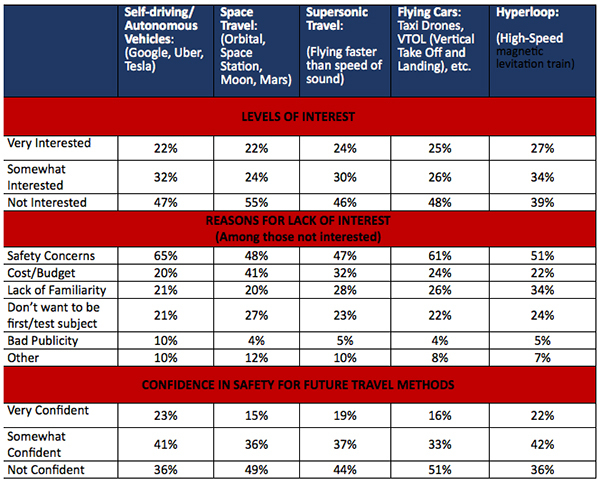 While the current outlook for traveler uptake of self-driving vehicles is uncertain, the future is brighter with 64 percent of travelers confident that this travel method will develop safely enough for them to consider using, which, along with Hyperloop high-speed rail (64 percent), is well above the confidence for the safety of supersonic travel (56 percent), space travel (51 percent) or flying cars (49 percent). In total, however, only a minority are â€œvery confidentâ€� about the safety of any of these travel methods being safe enough for mainstream consumer use. Copyright 2017 Allianz Global Assistance. All rights reserved. From http://www.allianztravelinsurance.com.